There is a reason that barefoot is gaining momentum in North America and around the world, because it works! When combined with a proper diet and balanced minerals, many horse owners are discovering the healing benefits of barefoot care: brittle walls become thick, flat soles gain concavity, stretched white line (lamina) becomes tight and strong, pinched heels open up and spread out. This is because the hoof is encouraged to function the way it was supposed to without invasive procedures like open cuts or carving of sole. The hoof can act like the natural shock absorber it is and prevent problems like arthritis, ringbone, sidebone, splints, etc. Mild cases of ringbone and sidebone have been known to to dissipate in some cases. Even horses that suffer from navicular or founder can be restored to functional, or at least comfortable, lives. Now, I am not saying that every horse can be cured of such pathologies, sometimes the damage is too great to be helped, but isn't barefoot worth a try before you make the ultimate decision for you and your horse? Many owners have discovered barefoot this way. They had tried everything else to make their horse sound and decided to try barefoot as a last ditch effort to help their horse become comfortable again. 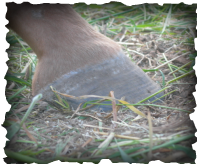 Maybe the hassle and cost of metal shoes has got you thinking of alternative hoof care. No matter how worn metal shoes become in 6-8 weeks, they have to be replaced or reset. 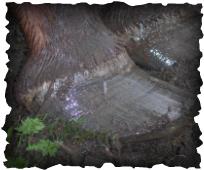 Hoof boots are easy to use and can last a lot longer than metal shoes and only hoof trimming is required on a regular schedule to keep the boots fitting optimally. Hoof boots are actually more protective than metal shoes because they cover the entire hoof (including the sole!) to help prevent sole bruising and absorb shock, resulting in reduced damage to muscles and joints. You have already made the first step to discovering natural hoof care by coming to this site. Check out the Links page for more information on barefoot trimming to see if it is right for you. Then make the next step and call a natural hoof care practitioner in your area to set up an appointment or consultation. Located in Mission, British Columbia. Serving the Lower Mainland and Fraser Valley. Available Monday, Tuesday, Thursday, Friday. Member of the Pacific Hoof Care Practitioners.